In OS X 10.5, you can use the Finder’s new Cover Flow view mode and Spotlight to look at tasks on your iCal calendars in a new and interesting manner. Imagine if you were, say, writing for Macworld, and you’d been asked to write a number of articles about Leopard. One way to see all of the Leopard-related projects is to use the find feature in iCal—just press Command-F, type Leopard, and see the results at the bottom of the window. But where’s the fun, where’s the pizzaz, where’s the excitement in something so simple? Instead, using my contrived example, let’s see how you could do the same thing in the Finder. First, switch to Cover Flow view mode (View -> As Cover Flow), then press Command-F to place the cursor in the Finder’s search box. 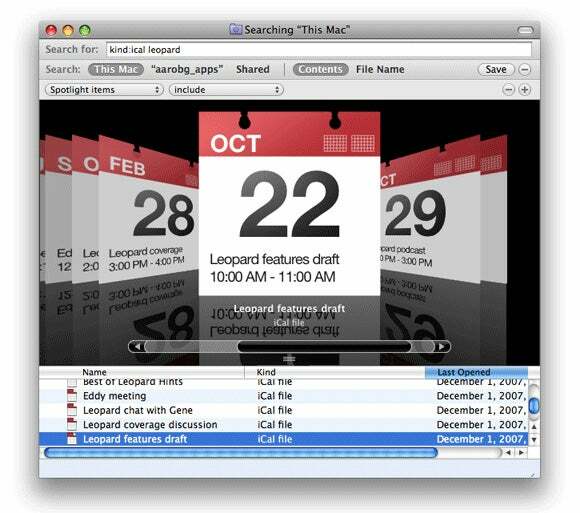 To isolate Spotlight matches to just iCal events, enter kind:ical in the search box, then press the Space Bar, and type in the word or words that you’d like to find on those iCal events—Leopard in this example. At this point, you may or may not see matches in the results area—on my upgraded laptop, I found some iCal events, but not all. By default in 10.5, iCal events are not included in Spotlight searches, so you need to manually include them. You can now easily see and flip through the matching events, each of which displays the event’s name and title on the calendar page. This is a pretty nice way to browse iCal events, but there are a couple of serious downsides. First, the year isn’t displayed, so if you’ve matched an older event, it’s hard to tell. The other, even bigger, issue is that you can’t view your events in chronological order—you’re restricted to either name, kind, or last opened date (the three columns shown in the area below the Cover Flow view). If you could sort on iCal event date, this view would actually be a very useful way to browse one’s calendar. Even as it stands now, though, it may be an easier option than launching iCal if you just want to quickly find out some event info.